One of the Capital’s leading businessmen has given his backing to plans to take the trams to Newhaven. Speaking after the Evening News revealed the SNP was likely to vote against the move this week, Sir Tom Farmer insisted the city could not afford to leave a job “half done”. The entrepreneur, Hibs’ majority shareholder, admitted he was initially against a tram service and didn’t understand the need for it. But now that the first phase of the project is complete, the 75-year-old said he believed the council had to extend the line. Mr Farmer, who founded Kwik-Fit, said: “When the trams were first mentioned I was not a supporter. I didn’t see a necessity for them. “I thought ‘we were a city with a very good bus service’. But the trams went ahead, now we have them and they have proved to be very successful. “There is a demand for them. And one thing I am sure of is that we cannot afford not to extend the trams to Newhaven. To be a modern city and a city that is growing, we have to develop the asset we have created. We have to look ten years ahead and other cities in Europe have a fantastic tram service. Mr Farmer also stressed transport bosses had to learn from mistakes which saw the first phase of the project run well over budget. He urged them to seek advice from financiers and consultants to ensure any extension was managed “efficiently”. He said: “We should also be careful about things and learn from our mistakes. The initial project went well over budget. 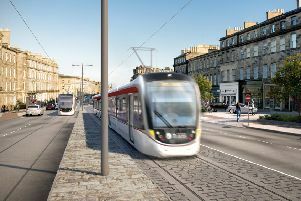 City leaders insisted on Friday that the proposals to take the tram down Leith Walk could be funded without affecting the council’s day-to-day budget. But a report recommending the go-ahead for the extended route raises the prospect of bus passengers having to help foot the bill, despite earlier assurances buses would not be used to subsidise the trams. The cost of the extension to Newhaven was estimated at £144.7 million when the options were last reported to the council in June. But since then inflation has added a further £2.5m and an extra £15m contingency allowance has been built into the plan, taking the total cost to £162.2m. The latest report, due to be considered at this week’s meeting of the full council, said the early cost of the project should be met by using dividend payments from Lothian Buses. The Evening News revealed last week that the city’s SNP-Labour coalition was divided on the proposed extension, with Labour leaders keen to see it built and the Nationalists claiming the financial argument is not strong enough, particularly with the council facing a huge squeeze on spending.